Here’s a quick, cheap and easy solution to make a sit stand desk. It can be switched easily between sitting and standing. The desk cost a total of £8.00 and a few bits of wood that I had lying around. We are all spending too much time sat down and our health is suffering. More people than ever before need to work from a computer so its easy to spend most of your working time sat down. Stand up desks are becoming more common place and benefits include improving posture, reducing diabetes and obesity. Most experts agree just standing also causes problems. What’s best is a sit / stand desk where a user can easily switch between sitting and standing. These are quite expensive and its a large investment to make if you’ve never tried a stand up desk. 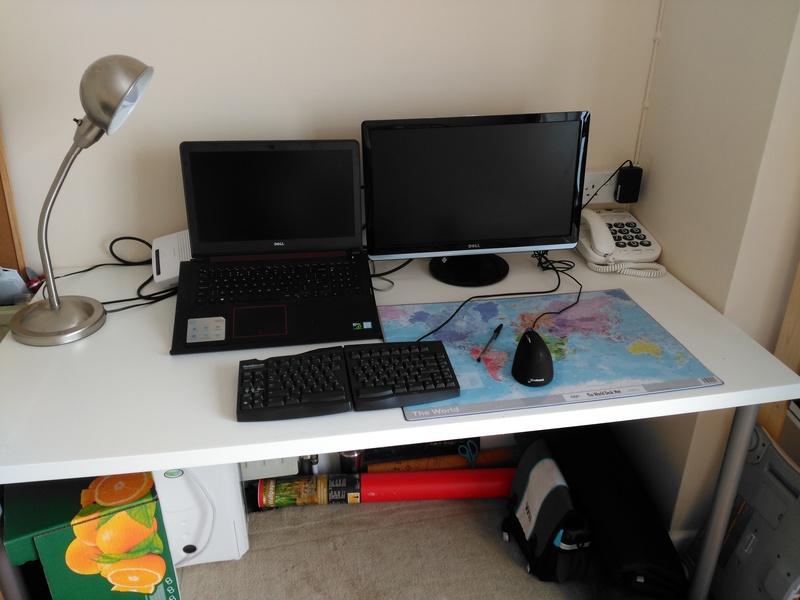 This is my existing desk, it does the job for sitting but lets make it s stand up desk. Take one or two (one for each display) lack coffee tables from Ikea. They are very light as they are mainly cardboard coated with plastic. The legs just twist on and the price as of May 2016 is £4.00 in the UK. Put these tables on your existing desk. The feet are soft chipboard so shouldn’t scratch your existing desk, but in doubt put on some felt protectors. 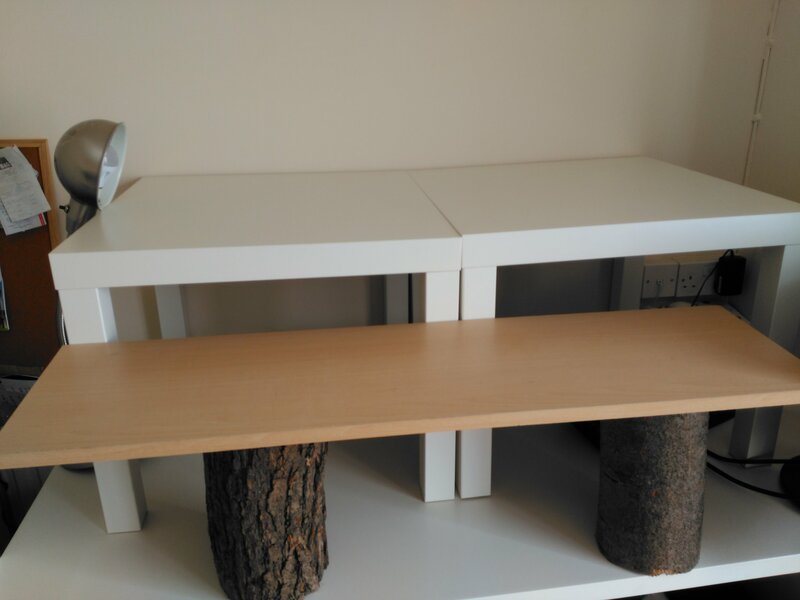 Next get two logs of the same height that will hold the keyboard / mouse shelf at the right level for you. I have a wood burner so just saved these two from being burnt. The level that works best for me is keeping my arms at a right angle. Place a piece of wood on top of the logs. I had this lying around but can be bought very cheaply. There you have it, your stand up desk is ready to put all the equipment on it and start using. 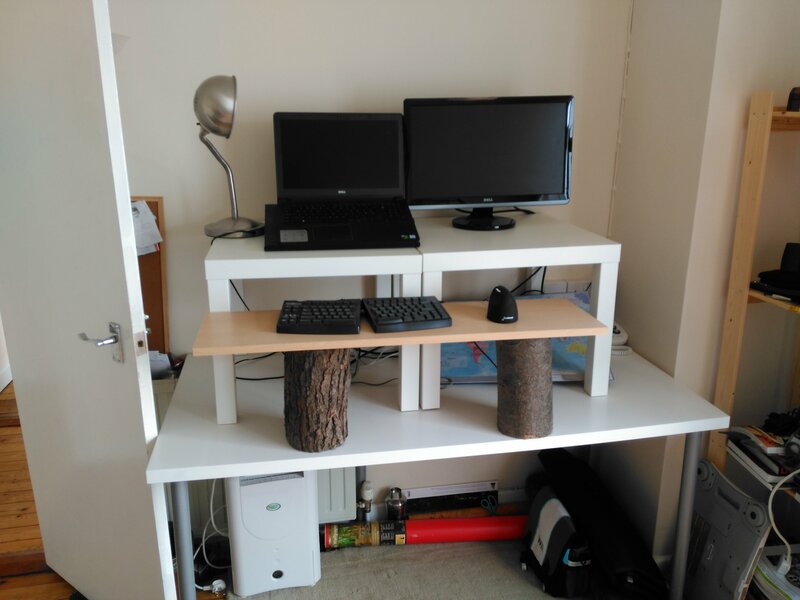 I recommend using the desk for a while and then when you are happy with the level of the keyboard / mouse shelf you can screw the flat wood to the logs and add a support in between the two logs. 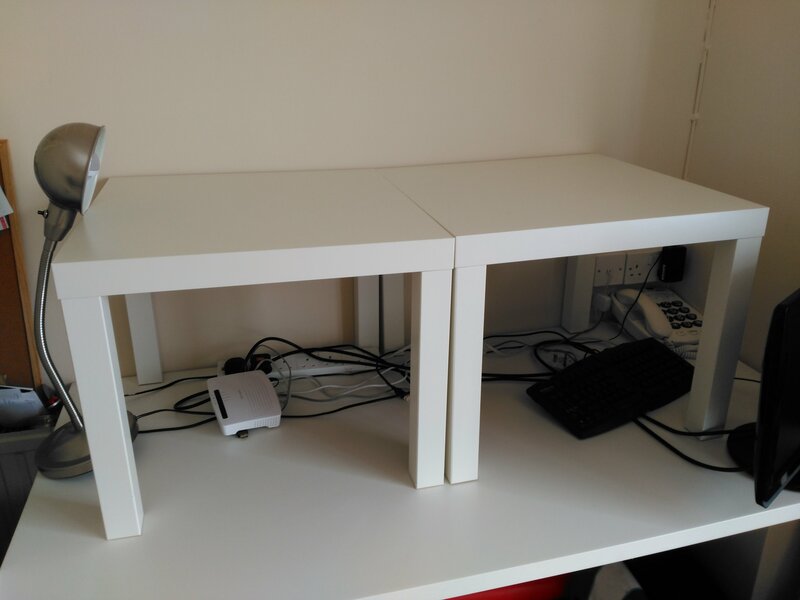 The DIY stand-up desk can quickly be made back into a normal sit down desk – takes me about a minute and give a natural screen break.